Bracebridge is north of Toronto in a picturesque region of Ontario called Muskoka. Many have cottages on the myriad lakes. 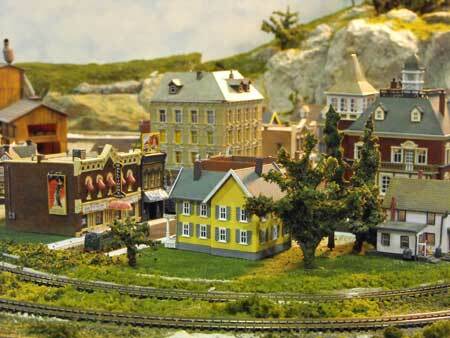 Our Nottawasaga Model Railroad Club didn't attend this model train show last year. 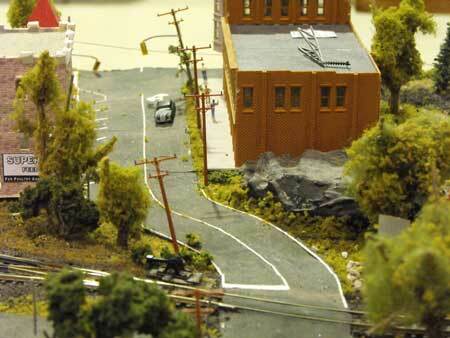 We were one of the dozen or so layouts set up in 2009 and each year since. 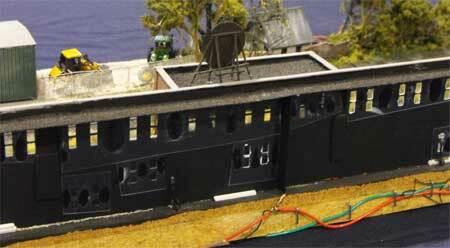 Our layout was a DC (not DCC) HO layout in 2009 that we encourage young children to operate. 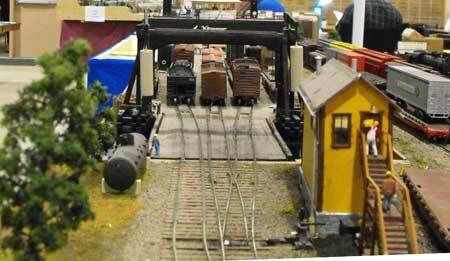 We were kept busy for two days with children as young as 4 years old running the trains with our guidance. We made many parents very happy! 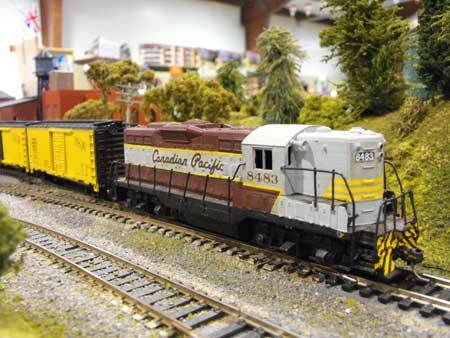 Our travelling layout is now Digitrax DCC and the kids run it better than most adults! 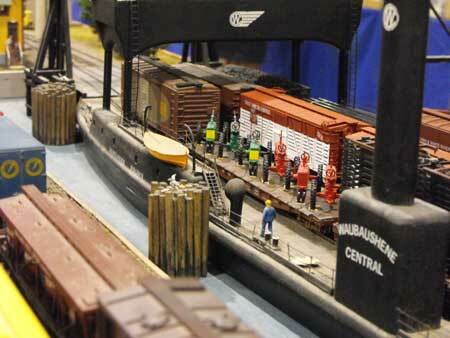 There were a few exhibits and layouts at this model train show that I have not shown on other pages. 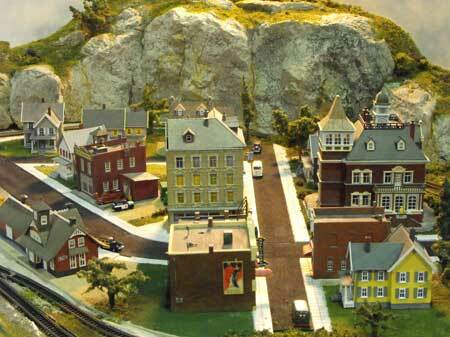 The video clip shows a fascinating incline railway that's about six feet high. The scale is difficult to determine, but there are Lego passengers in the open gondola so that gives you some indication. 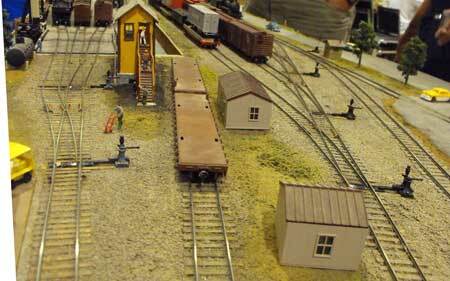 There are also a couple of clips of an HO Climax pushing an operating snowplow on an HO modular layout. 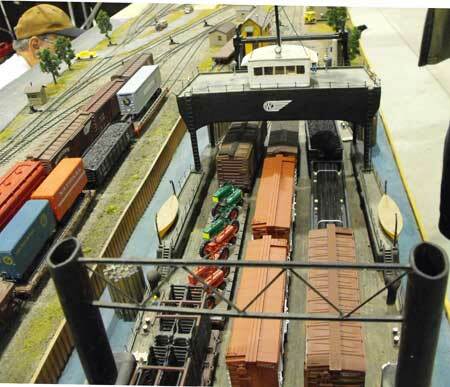 As well, there's a short clip of trains thundering through a 3-track junction on an Ntrak layout and a few short clips of a N gauge layout under construction. 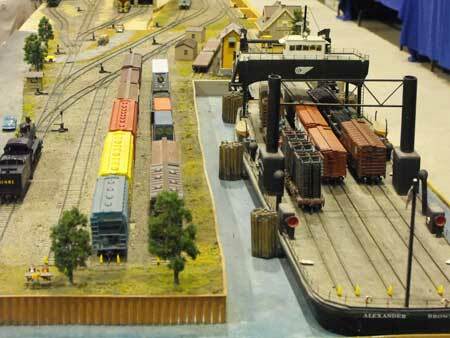 The owner (I didn't get his name) was running several N scale engines in Toronto, Hamilton and Buffalo livery. 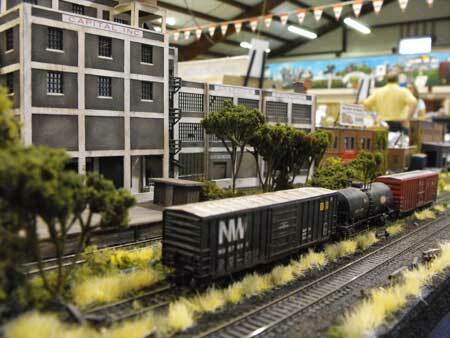 The Union City group from Midland exhibited their new switching layout under construction. One of the highlights is a car ferry. Here are sone photos. Click on them for a larger view. 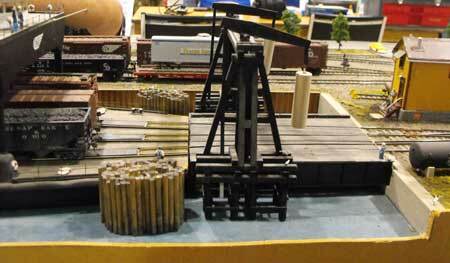 Below are three photos I took at the model train show of the N scale layout under construction that's shown in the video clip. These are of the town areas at either side. 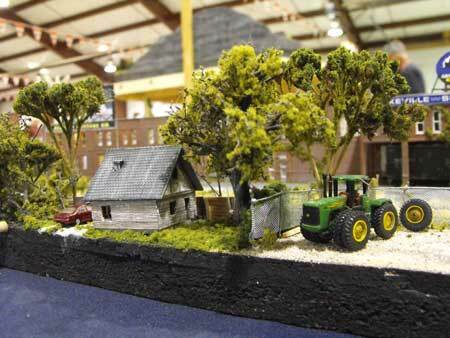 The complete layout appears to be about 10 by 6 feet. 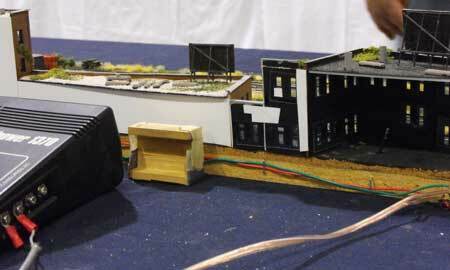 I was impressed with an N scale module on display that used a lot of false front buildings as a backdrop. Here are a few photos including two taken from behind the backdrop. 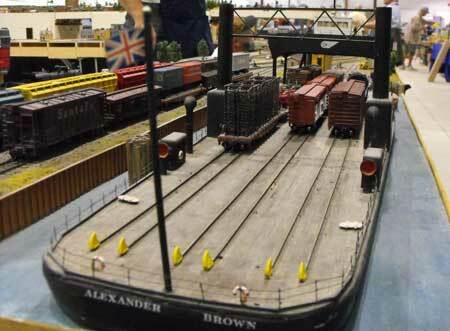 These are a few miscellaneous shots I took of the Sudbury Club's N scale layout on display. I like the road and buildings. Note the Canadian nickel on the rocks. 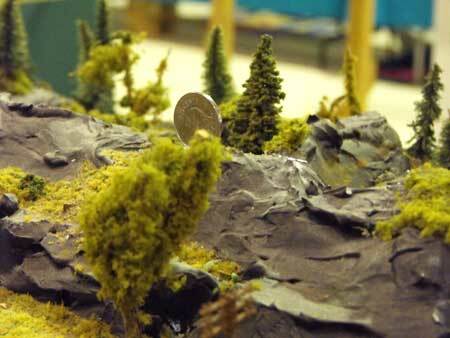 Sudbury is known for its nickel mines. 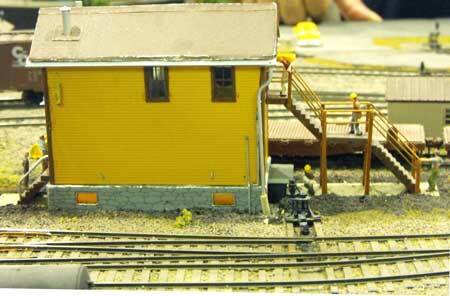 Finally, a couple of photos taken of our Nottawasaga Model Railroad Club layout. 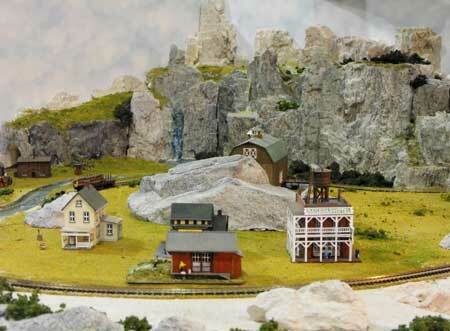 Return from "model-train-show" to the Train Photos overview. 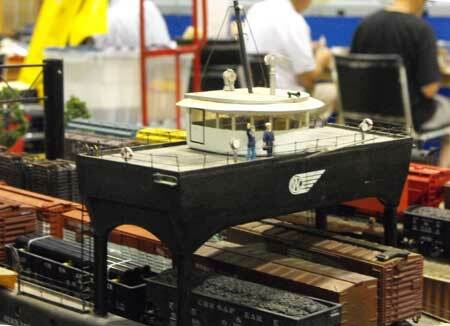 Return from "model-train-show" to my Home Page.